Available in four different strength settings, the Strike+ range offers high ultimate strength in varying levels of consistency, making it ideal for use with a number of placement methods, including pump, skip and direct. Vital for construction projects where durability is key, in sectors such as road, rail and infrastructure, these high-performance concretes have been specially formulated with speedy setting times, ranging from 15 minutes to four hours. The range also boasts a myriad of other distinctive properties, including high resistance to chlorides, low surface absorption, low shrinkage and high freeze thaw resistance. As a result, Strike+ products are well placed to meet specified return to service requirements in compressive strength, where its early strength gain properties can be adapted to meet complex contract specifications. 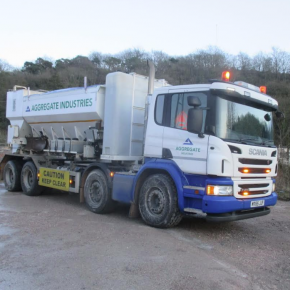 David Porter, Area Manager Concrete (East Midlands) at Aggregate Industries, commented: “With a greater onus on contractors to deliver ever more complex builds to tighter budgets and reduced deadline, speed, efficiency and durability during the construction process has never been more critical. “That’s why we’ve launched our new Strike+ range of high early strength concretes. Its rapid setting times enables users to dramatically increase their productivity when building carriageway replacements, airport hard standings, warehouses, precast structures. Strike+ products are manufactured and delivered using volumetric concrete mixers, with water only added to the mix at the point of use. The ranges consists of specially blended binders, PC52.5N CEM1 (BSEN 197) and carefully selected concrete aggregates (BSEN 1260).